As a Romanian artist having lived through political struggles and the subsequent attempts at reconstruction, Mircea Suciu (b. Baia Mare, Romania) depicts images brimming with intangible but undeniable tension. The figures found in his works often shy away from the viewers, as if hiding in shame or looking to escape from the boundaries of the frame. Some are even evocative of egocentric children, “hiding” by covering their faces, conflating their inability to see with the audience’s as well. Such images in monochrome settings cast a curiously eerie shadow upon Suciu’s works, making them all the more intoxicating. Such depictions, however, are not intended to simply engage; the subjects of Suciu’s artwork express the underlying meaning of aggression, defensiveness, and suffering, of what civilians are inevitably exposed to in times of war as a result of religious fundamentalism and extreme nationalism. Mircea Suciu was born in 1978 in Baia Mare, Romania. 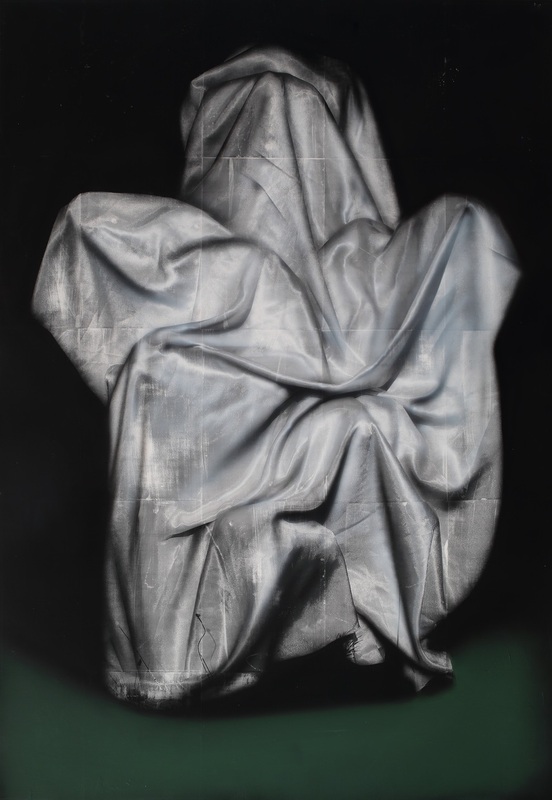 After having studied painting at Art and Design University of Cluj-Napoca, Suciu’s artistic career took off with a group exhibition at Mestna Galerija in Ljublijana, Slovenia, followed by many more in spaces such as Espace Louis Vuitton in Paris, France, Fondation Francès in Senlis, France, Maison Particulière in Brussels, Belgium, MODEM Centre for Modern and Contemporary Art in Debrecen, Hungary, and more. His works were shown in the 7th Gwangju Biennale in 2014, the 4th Biennial of Prague, and the 11th Biennial of Istanbul. 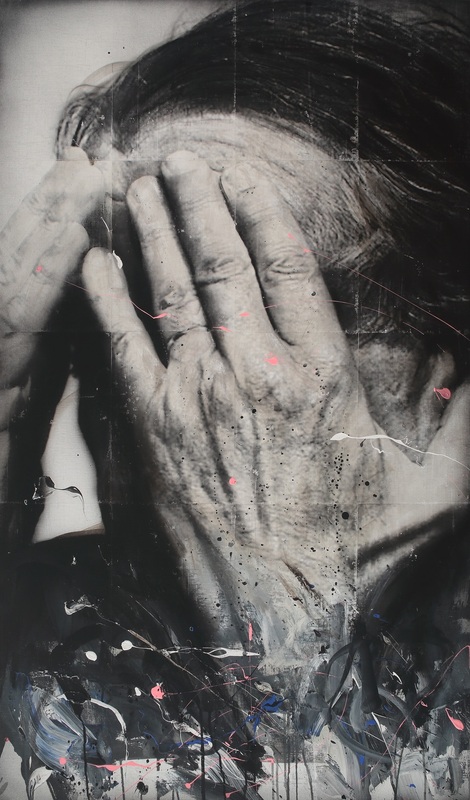 Suciu currently lives and works in Brooklyn, NY and Cluj, Romania. Mircea Suciu는 사회적, 정치적, 그리고 심리적인 주제를 주로 다룬다. 신문이나 잡지 외에도 다양한 매체에서 이미지를 가져오며, 모노타입 기법을 기반으로 아크릴이나 유화 물감 등 다양한 안료를 혼합한다. 이는 루마니아인으로서 작가 개인의 생의 경험과 닿아 있는지 모른다. 냉전과 철의 장막의 붕괴 등 이데올로기와 국가 권력은 한데 얽혀 삶을 관통하였다. 비극적인 역사 경험 속에서 인간이 겪는 소외와 상실, 그리고 복잡한 정체성은 시각적으로 구현되고 상징적으로 형상화된다. 공간에 자리하는 인물 혹은 인물들. Suciu의 이미지는 어딘가 친숙한 광고 이미지 같지만 작가는 다음 순간 익숙함을 제거하고 인물은 언제나 시공간을 짐작 할 수 없는 공허한 배경 속에 놓인다. 이런 그의 작품을 그득 채우는 것은 실체 없는, 그러나 분명한 긴장감이다. 긴장은 사이사이를 파고든다. 작품 속 공간과 인물 사이, 음울한 색조 사이, 그리고 작품과 관람자 사이까지도 층층이 스민다. 이러한 긴장감은 우리가 바라보는 인물의 시선이, 얼굴이, 경우에 따라서는 머리가 가려져 있다는 것을 발견하는 순간 극대화 된다. Suciu의 작품 속 인물들은 모두 가려지고 차단되어 있다. 가리워진 얼굴과 차단된 시선은 도망, 혹은 해방을 갈망하는 듯 하기도 하고 인간 소외나 상실을 고발하는 것 같기도 하다. 작가는 ‘가려짐’에 천착하며, 어딘가 관람자를 본질적으로 불안하게 만든다. 단색조의 배경 위에 어딘가 기이한 명암이 드리워진다. 더 좁고 어두운 어딘가로 얼굴을 넣어버린 인물들의 자세는 무기력하고 색조는 한껏 우울하다. 이는 그가 겪어낸 인간 역사의 상흔들, 불행한 역사적 사건들에 대한 시각적인 재현이다. 더 깊은 심연으로 처박히는 것 같은 인물들은 지배적 권력, 역사의 억압에 의해 정체성을 상실해가는 개인인지 모른다. 이는 당대에 스러져간 개인들에 대한 작가의 고발이자, 비극적인 시대에 대한 애도이다. 얼굴에 나타나는 다양한 ‘가려짐’은 이후 ‘장막’의 등장으로 더 적극적인 차단으로 나아간다. 천이나 커튼 등으로 등장하는 장막은 얼굴을, 더 나아가서는 인물 전체를 가린다. 이는 더욱 총체적인 억압으로, 얼굴의 상실로 정체성을 상실한 개인은 이제 장막에 가려진 신체의 상실로 존재의 위기에 놓이게 되는 것이다. Suciu가 그려내는 단절된 개인은 관람자와도 대면하거나 소통할 수 없다. 인물의 철저한 고립과 외면은, 역설적으로 더 깊은 울림과 상실을 전달한다. 가려짐으로써 오히려 표출되는 감정의 폭발이 있다. 이처럼 작가는 근사한 시각적 은유로 시대를 고발하고 개인이, 시민이, 그리고 민중이 상실한 것들을 이야기한다. 그는 역사와 사회가 어떻게 인간을 고립시키고 소외시키는지 블랙유머로 세련되게 포장해 던지고 있다. 비극적인 어제가 남긴 상처와 기억해야 하는 오늘, 그리고 나아가야하는 내일에 대해 이야기하고 있는 것이다. Mircea Suciu는 1978년 루마니아 Baia Mare에서 출생하였다. 루마니아의 Cluj Art School에서 회화를 공부한 뒤, Mestna Galerija in Ljublijana, Slovenia에서의 그룹전을 시작으로 예술가로서 커리어를 쌓아 나간다. 주요 전시는 Espace Louis Vuitton in Paris, France, Fondation Francès in Senlis, France, Maison Particulière in Brussels, Belgium, MODEM Centre for Modern and Contemporary Art, Debrecen, Hungary 등에서 진행되었으며, 또한 2014 광주 비엔날레, 4회 프라하 비엔날레, 그리고 11회 이스탄불 비엔날레에서 작품을 선보였다. Suciu는 현재 뉴욕 Brooklyn과 루마니아 Cluj에 거주하며 두 도시를 기반으로 활동하고 있다.